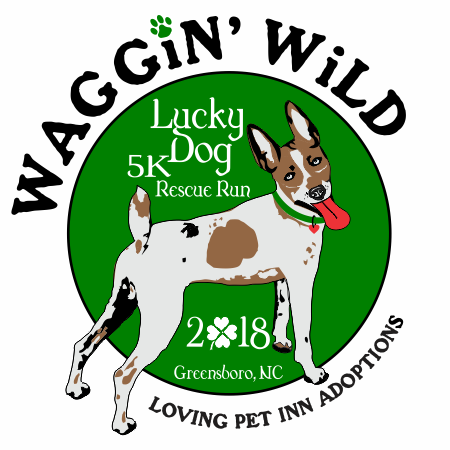 Waggin' Wild 5k is a walk/ run for people of all ages, individuals, teams, competitive runners and leisurely strollers to participate in this fundraiser. Vaccinated and well-mannered leashed pets are welcome, family participation is encouraged! by helping raise funds for this great cause! Part of the 2017 Greensboro Race Series! Groups/Teams of 6 or more $20.00 if registered by 2/15/17! Entry fee includes a custom t-shirt, post race refreshments, raffle tickets, awards and official race results. T-shirts by Triad Pawprints, Post Refreshments from Domino's, S&D Coffee & Krispy Kreme! Awards will be given to the top 3 male and female overall finishers and top 3 pets. Age Group awards will be presented to the top male and female finishers in the following groups: 10 and under, 11-19, 20-29, 30-39, 40-49, 50-59 and 60-older. Prizes include Omega Sports, Maxie B's, Cheesecakes by Alex, Dirty Dogs Dogwash and M'Coul's Public House! Raffle: You will receive 2 free raffle tickets with your registration! Put your name & phone number on the back and place in the bowls of the items you would like to win, located at the LPIA table at the race. Additional raffle tickets are available for $2.00 each. Pampering items from Chevalrie Salon. Our "photo booth" will be setup for you to drop in and get your individual, group or pet shot. Please NO RETRACTABLE LEASHES for safety of runners. Runners and runners with dogs will line up in front of walkers. Please look for signs. 9:00 AM - Our "photo booth" will be setup for you to drop in and get your individual, group or pet shot. 9:00 AM - Raffle Open: You will receive 2 free raffle tickets with your registration! Additional tickets available for purchase. 9:30 AM - LPIA Alumni Group photo!! We would love to get a group photo featuring our previous adopted pups and their awesome parents. 10:00 AM - Race will start on paved Greenway. 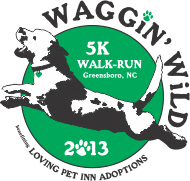 11:15 AM - Recovery food, Runner/Walker/Pet Awards, Prizes and Raffle announcements. Come out and show your support by helping raise funds to control the over population of animals! Be sure to download this Free App and select Loving Pet Inn Adoptions! 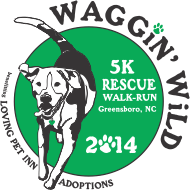 Click logos below to see photos from past Waggin' Wild 5K events.